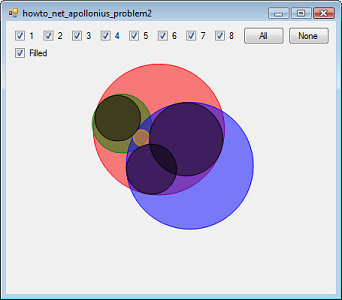 This example shows how to draw three circles and find circles that are tangent to all three in Visual Basic .NET. This example is similar to previous one Find circles that are tangent to three given circles in Visual Basic .NET except it lets you click and drag to draw the three given circles. It then finds the (up to) 8 tangent circles. For more information see the previous example and the links it mentions.